I really like the taste of fresh tofu. It's just so much better than the stuff you can get in the supermarkets that's been sitting in the same old sour water for days or even weeks. I can get good fresh tofu from my local Asian grocery store, but I don't always have time to head over to get some, so I thought it would be nice to try and make it myself! I always thought making tofu would be very complicated, but it's not so bad really. 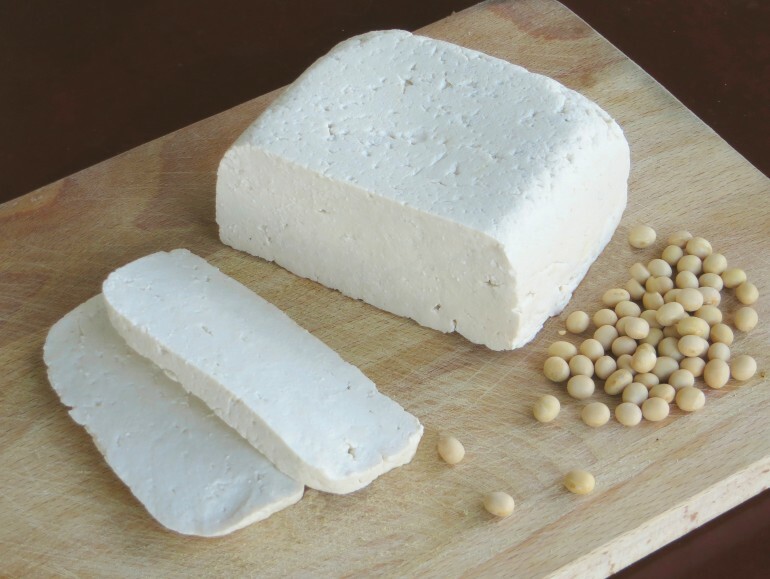 Just soak some soy beans, blend them with water, strain out the milk, cook it in a pot, add a coagulant, strain out the whey, and press the tofu into shape. Still seems like a long list of tasks, but the active work takes only about half an hour. The added advantage of making your own tofu is that you can make it as soft or firm as you like. It's also much easier to flavor since you can add herbs or spices directly to the curd, instead of (or in addition to) marinating the tofu later. Making your own tofu is very cheap. You also get two useful byproducts: the pulp/okara that can be used in baked goods, burgers and seitan and the tofu whey, which can be used like aquafaba in all kinds of recipes. To make tofu, you need a coagulant which you add to the hot cooked soymilk so it will separate into solids (tofu) and liquids (whey). You can use various coagulants. If you want to keep it simple, you can just use a few tablespoons of vinegar or lemon juice. This makes a very firm, slightly crumbly tofu. Personally I prefer to use gypsum/calcium sulfate. It gives the tofu a softer texture and makes it a good source of calcium. You can order calcium sulfate online or if you are a cheapskate you can probably get some gypsum powder for modeling purposes from the local toy store. Put the soybeans in a large bowl, and cover them with a generous amount of water. Take into account they will triple in volume. Let them soak for a minimum of 8 and a maximum of 24 hours. If you want, you can soak additional beans and freeze them after soaking, so you can skip this step next time you want to make fresh tofu. Drain the soaked beans and put half of them into the bowl of your food processor or high speed blender together with one liter/ 4 cups of water. Blend until smooth. Depending on the strength of your machine, this may take a few minutes. Line a large colander with a thin clean cloth and place it over a large pot with a thick bottom. Pour the blended soy mixture into the cloth and wait for in to drain. In the mean time, blend up the other half of the soy beans with an additional liter / 4 cups of water. Once some of the milk in the colander has drained, you can add the second batch of the blended mixture. Bring together the corners of the cloth and twist it to squeeze out as much of the liquid as possible. You can set aside the pulp/okara for later use. Bring the raw soy milk in the pot to a boil and let it cook for 10-15 minutes to get rid of the unpleasant beany taste. Take care it doesn't boil over, as this happens very easily. Use an oversized pan, don't cover it with a lid and watch the milk carefully when it comes to a boil. Don't turn the heat up to high, or the milk can burn on the bottom of the pan. During boiling a skin will form on the milk. You can use a cocktail stick to remove it at the end of the cooking time. In Japan these skins (yuba) are considered a delicacy. When the soy milk is cooked, take the pot of the heat. Mix the calcium sulfate with half a cup of water and stir it into the hot milk (if you use vinegar mixing with water is not necessary). The milk will now start to coagulate. Let the mixture sit for a minute or two until the milk has fully separated into white tofu and clear yellowish whey. If the whey is still cloudy like milk, add a bit more coagulant. Line your colander or a specialized tofu press with another piece of cloth and carefully pour the coagulated mixture into it so the tofu lands on the cloth. Fold the cloth over the tofu, cover it with a plate or board and put something heavy on top to press out the excess liquid. Let the tofu sit like that for 30 minutes up to an hour or more, depending on how firm you like your tofu. Keep the tofu in a container in the fridge. You can submerge it in plain or lightly salted water if you like. This way the tofu will stay fresh for 3 to 4 days or more, if you refresh the water daily. I assume the nutritional value of this tofu is similar to the store bought variety, so 100 g (1/3 cup) has about 144 kcal, 9 g fat (3 g saturated), 1 g net carbohydrate, 2 g fiber and 17 g protein.